Full disclosure, I was provided a copy of this book by the author, however, have voluntarily chosen to write a review. All opinions are my own. Maggie is a typical “hopeless case”. Knocked up by her boyfriend on her prom night, Ben dumps her for the party life shortly after graduation. When her parents kick her out of the house after baby April is born, what’s a girl to do? Seventeen and mom to an asthmatic daughter, Maggie finds herself bouncing from job to job, barely able to pay the bills and keep her daughter in life-saving medication. That is until a chance meeting with Rodrigo and Jesus at the diner where she works presents an opportunity to change her station in life. 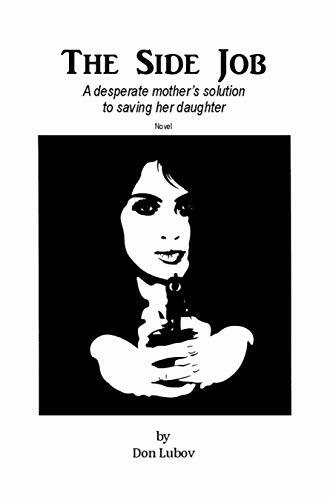 Finding herself in the employ of a local crime boss Maggie takes on several lucrative side jobs that enable her to provide a better life for herself and her daughter. The more jobs she completes, the better her position improves but she soon wonders how many more of these jobs she can endure before she either loses her humanity all together or becomes a target herself. While not a long or intricately written book, Don Lubov’s “The Side Job” sucked me in with its stark simplicity. Where others may see a poorly constructed or disjointed story, I saw a brilliantly presented narrative with a decisively noir feel, which is exactly what this book needed. The early portions of the book read more like snippets in time and even possibly memories which served to advance the story to the “meat” while giving enough back story into the main character to have the latter portions of the story make sense. If you’re looking for a quick story to fill an evening, Lubov’s Side Job will not disappoint.